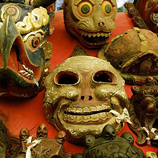 Bhutan’s arts and crafts reflect the unique spirit and identity of the Himalayan kingdom. The art of Zorig Chosum - or the thirteen arts and crafts of Bhutan - remains very much alive today. They include carpentry, blacksmithing, weaving, sculpting and many of the crafts described below. There are two institutes of Zorig Chosum where these traditional arts and crafts are being taught today - one in the capital, Thimphu, and the other in Trashi Yangtse in eastern Bhutan. The arts and crafts continue to thrive despite a small tourist market. Much of this is due to the government’s support and emphasis on the preservation of culture and tradition. Bhutan’s textiles are an integral part of daily life in this Himalayan kingdom. Gifts of cloth are offered at birth and death, and during auspicious occasions, weddings, and when someone gets promoted to higher level in his/her profession. Textiles are fashioned into clothing, crafts, and various kinds of containers. Bhutanese textiles are renowned for their distinctive patterns inspired by nature. Each region has a specialised design. Bumthang, for example, is known for its vegetable dyed wool weaves called yathra, and exquisite pure silk weavings, Kishuthara, are famous in the eastern region of Lhuentse where it originates. Weavers, mostly women in remote communities, pride themselves on being able to create textiles that reflect a visually stunning combination of colour, texture, pattern and composition. Bhutan is holding on to this traditional skill despite rapid modernisation. Bhutanese textiles are now prized among collectors as a rare art form that is being practiced only among a very small community in the remote Kingdom of Bhutan. 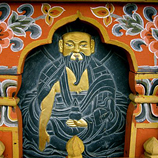 Most Bhutanese art, including painting, are religious by nature. Moreover it is the process of creating the paintings that is important, most traditional painting is anonymous without an artist’s signature. The Bhutanese tradition of painting is called lhazo. This refers to all types of painting including traditional paintings, called thangkhas, which are scroll paintings of Buddhist iconography executed in mineral paints. Bhutanese paintings of religious and other symbolic motifs also adorn houses in Bhutan, both inside the home and on exterior walls. Thangkha style painting is highly stylised and strict geometric proportions are followed. Bhutanese sculptors are well known in the Himalayan region. Many famous sculptors have been, and still are, making clay statues of Buddhist figures for important monasteries in the region. Clay is the traditional material for local sculpture, known as jinzob. The art is expressed in statues and ritual objects and can be seen in the numerous monasteries throughout Bhutan. Many of Bhutan’s monasteries boast of exceedingly fine central statues that sometimes rise up as high as three floors. The art of sculpture is being kept alive at the Institute of Zorig Chosum where it is taught as a core subject. The Bhutanese have always used their own handmade paper called deysho. Made of the bark of the daphne plant, this paper is used for the printing of religious texts, traditional books as well as for wrapping gifts. It is an extremely durable paper that is fairly resistant to insects. Traditional paper making continues as an additional activity on the farm to earn some extra income for the paper makers. A few paper factories have been established and some of them are now producing ornamental art paper with the inclusion of flower petals, and leaves, and other materials. Vegetable dyed paper is also being made for special occasions. The carving of wood is an ancient craft that continues to play an important role in modern Bhutan. The numerous prayer flags that flutter across the vast ridges of Bhutan are all printed from carved wooden blocks. Parzo, or the craft of carving is not restricted only to wood. Carving is also done on slate and stone. Woodcarving is, however, the most common. It is used for making wooden blocks to print traditional books that are still much highly sought after today. The wood is usually collected and seasoned for more than a year before it is carved. Bhutan’s artisans are also well known for their highly skilled wooden carvings which adorn pillars and windows in monasteries, offices and public buildings. The art of sword making falls under the tradition of garzo (or blacksmithing) which includes the making of all metal implements including knives, chains, darts etc. Today, ceremonial swords are now a highly specialised craft. They are still being made for the gentry or senior officials who have been ceremoniously honoured. Ceremonial swords are worn on all special occasions while almost every Bhutanese male, even children, wear a traditional short knife called the dudzom. History has it that Bhutan’s best known sword maker was the treasure discoverer, Terton Pema Lingpa, from central Bhutan. For ceremonial occasions, it is not uncommon to see Bhutanese men wear traditional boots made of cloth that is handstitched, embroided and appliquéd in Bhutanese motifs. The different colours used on the boot signify the rank and status of the person; hence, Ministers wear orange, senior officials wear red and the laity wears white. There has been a revival of traditional boot making in recent years. Popularised by the emphasis on preservation of culture and tradition, boot making is also a subject taught at the Institute of Zorig Chosum. There are also shorter boots that reach above the ankle for women. Traditional Bhutanese boots are a must for formal events, and lend a ceremonial air to such occasions. Many villagers and retired monks also wear simpler traditional boots without the fancy appliqué work. The art of working with cane and bamboo is called thazo. Certain regions in Bhutan are famed for its bamboo and cane craft. 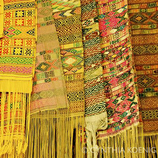 Rural communities in Zhemgang and Trongsa produce a variety of crafts with these materials. They include the distinctive bamboo hat called the belo that is still popular with the people in the area, and the still popular Bhutanese “Tupperware” basket called the bangchung. The popular folk craft also include baskets of varying sizes for the home and for travel on horseback, and containers for carrying local drinks , the homebrew called arra. With archery as a national sport, the making of bamboo bows and arrows are picking up momentum once again particularly just before the annual national archery competition. Many of the craftsmen look out for specific types of bamboo and mountain reeds to be fashioned into bows and arrows. These are picked at particular seasons, whittled down to size and expertly fashioned into the bow and arrow that has enabled Bhutanese men and youth to play a unique form of archery over the centuries. A well made set of bows and arrows are instrumental to a good game of archery. Traditional Bhutanese jewelry is usually silver and gold jewelry with intricate motifs. They include heavy bracelets, komas or fasteners for the traditional women’s dress, the kira, loop ear rings set with turquoise, and necklaces of the most valued stones in the Himalayan region - antique turquoise, coral beads and the zhi stone. The zhi stone is a highly prized stone in Bhutan and among Himalayan Buddhists who believe in its protective powers. The stone is distinguished by its black and white spiral designs called “eyes”. The zhi is believed to be an agate which were made into the zhi bead. There are now many replicas of the ancient zhi stone available in the market. The best place to see Bhutanese jewelry is during a local festival where women turn up in their finery and jewelry. Some of them are draped with the traditional necklaces of coral, the size of small stones.